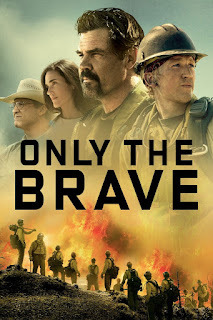 The 2017 film, Only The Brave, is based on the true story of the firefighting squad known as the Granite Mountain Hotshots, a group of elite firefighters who risked everything to protect a town from a historic wildfire. In 2007 Eric Marsh (Brolin) of the Prescott (AZ) Fire Department is frustrated with the status of his crew fighting forest fires, where they're known as a type 2 crew, and during fires, the Type 1 or "Hotshot" front line crews have the power to overrule his operational suggestions, even when it comes to his own area's sorrow. Motivated to change their status, Marsh gets approval from the Mayor to organize a certified municipal-based Hotshot crew for Prescott. With his new focus, Marsh needs new recruits, which includes the troubled young man named Brendan McDonough (Teller), to undergo the rigorous training and qualification testing for the most dangerous of fire fighting duty of type 1 fire fighters. Marsh's new team gets themselves certified and hailed as the Granite Mountain Hotshots. In doing so, all the men, especially McDonough, are changed as new experiences and maturity is achieved in fire-forged camaraderie. All this is put to the test durig the notorious Yarnell Hill Fire in 2013. The story starts out watching a fire captain working to get his crew recognized as a qualified team of firefighters called Hotshots. After that point, they make the cut and start traveling the country as they help battle extreme fires. It's quite the dramatization of the crew as they grow and develop, we follow their ups and downs from before and after their qualifications. The methodology of story telling draws you into each character's story, daring you to like them all, whether you like it or not. Part way through the film I started to realize that this was a film about a true story and went off to look things up. This drew me in even further, despite my normal rule about not spoiling movies, but this time, it made the film riveting. What I liked about this film was that I came across a few websites that nit pick films about true events, and to my surprise, many details in this film seem to be spot on with the characters, making this film even more enjoyable than ever.